So the deal is that I started out wearing just regular old trousers, dress shirts and neckties to work. I was sick of blending in with the business casual crowd. There were many, many weeks of shock and awe but it soon settled back down. I started adding sport coats and blazers to the outfits (does calling them "outfits" make me a metrosexual? Hope not.) and the shock and awe returned but only for many, many minutes. What's a coated and tied rebel to do? French cuff dress shirts with them link things? Suspenders (braces for those on the other side of the 'lantic)? Full blown suit? Tuxedo? I'm not sure yet. I have wondered if I ought to just quit trying to get attention. I'm not quite to that point yet. I just get treated too well when I'm out in public. That, and I kinda like the way I look all natty and such. For now I'll just post pictures of the daily outfits, uh, conglomerations and maybe make a few comments here and there. So today's conglomerate is pretty simple. The shirt is a non-iron broadcloth point collar that I picked up from Paul Frederick. The coat is just a Chaps navy blue wool sportcoat that I picked up at Kohl's. The necktie is a XMI Platinum number that I picked up on Ebay. It's got a navy blue background with blue paislies outlined in gold and has little white dots all over it. It's a pretty thick necktie so I tied it in a four-in-hand knot. 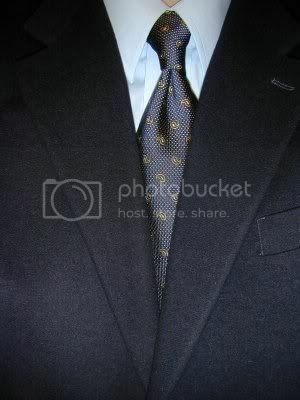 I usually use that knot but once in a while I'll get whimsical and use some sort of half-windsor variation. Only if I'm wearing a spread collar though.